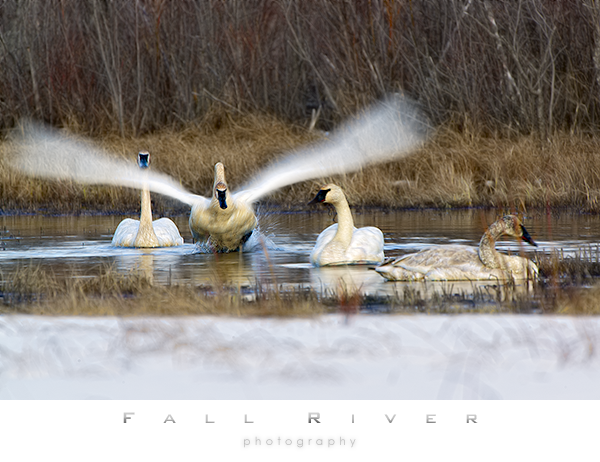 A majestic bird, the wing span of an adult Trumpeter Swan can reach in excess of 7 feet and the males, called Cobs, may weigh near 30 pounds. 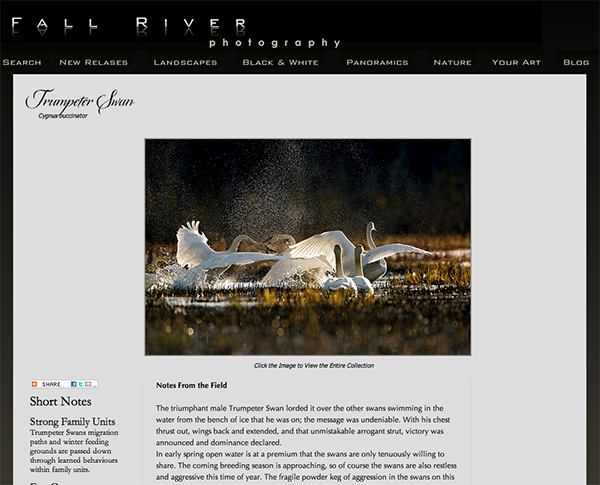 A Trumpeter Swan in the wild may live for 20-30 years and will usually mate for life. The breeding pair will return to the same wetlands for nesting, often using the same nest mound year after year. 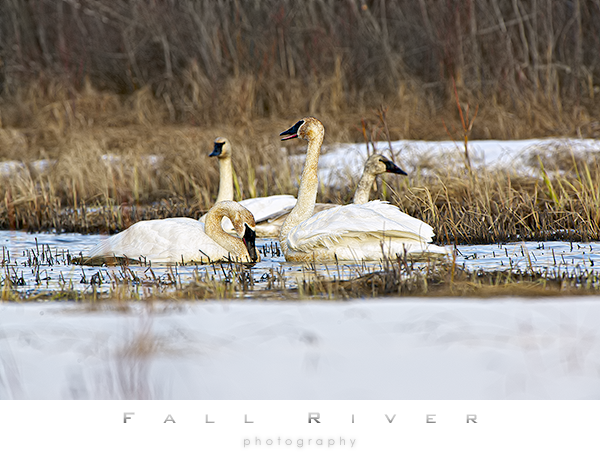 The Cob and Pen (the female trumpeter swan) will build a nest mound together with the Pen pilling up the vegetation the Cob collects then creating her nest depression. After laying 5 to 9 eggs in her clutch the pen incubates the eggs for 33 days only occasionally departing the nest to feed and preen and only after covering her eggs. The nest mound is typically surrounded by water and may be as much as 6 feet high providing excellent protection from mammalian predators however, the Cob will remain on watch and vigorously defend the clutch. After the cygnets hatch they move to the water within two days to feed on vegetation and small invertebrate. Their young, called cygnets develop very quickly gaining 20% of their body weight daily and are foraging for vegetation as their parents do, with their bills, after about 4 weeks. Shortly after the hatch a staggered molting period ensues for both adults. The Pen leads off shedding and regrowing her flight feathers on her wings and tail. The Cob follows with his molt only after the Pen has regrown her flight feathers thus ensuring there is always an adult capable of flight to defend the cygnets. The young cygnets grow rapidly and are feathered out by the 9th or 10th week. Flight usually is not possible prior to 15 weeks of development at which time they typically weigh about 20 pounds. Flight school usually starts in September and that skill requires daily practice to make the migration flight prior to winter freeze up. 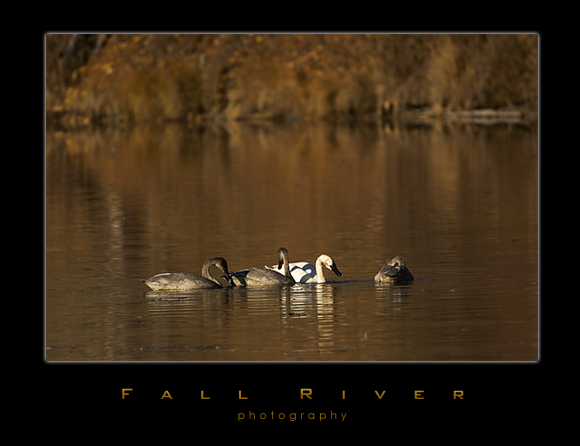 The cygnets follow the adults on their first migration to the family wintering grounds learning the migratory route and winter feeding habitat. 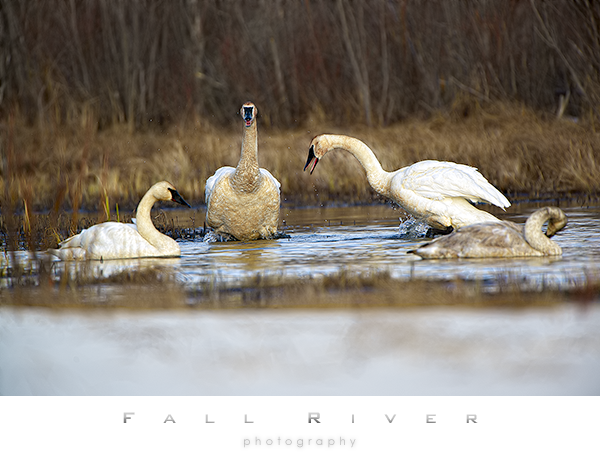 The young trumpeter swans usually remain with their brood-mates through at least the first year following their parents on the migration back to the breeding area. The young swans are then driven away by their parents but will remain together in sibling groups until reaching the age of about 2 years. 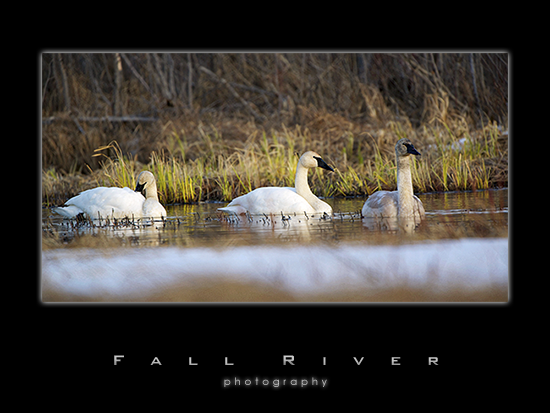 Annual regrouping of trumpeter swans with their parents at the established family wintering grounds is common behavior for the offspring and strengthens the learned patterns being passed along in the lineage. 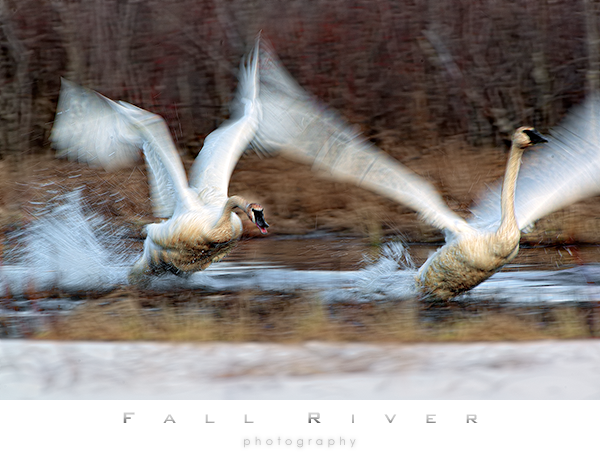 In year 3 the young trumpeter swans will select mating partners while on the wintering grounds and pair up to migrate back to the breeding areas. 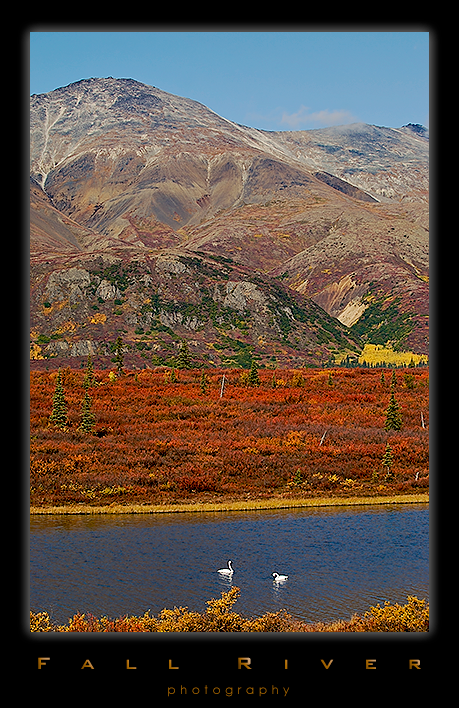 Unmated swans will gather in small flocks along the large lakes within their breeding grounds. Migration flights are in flocks made up of family units or comprised of several families inter mixed with non breeding swans. 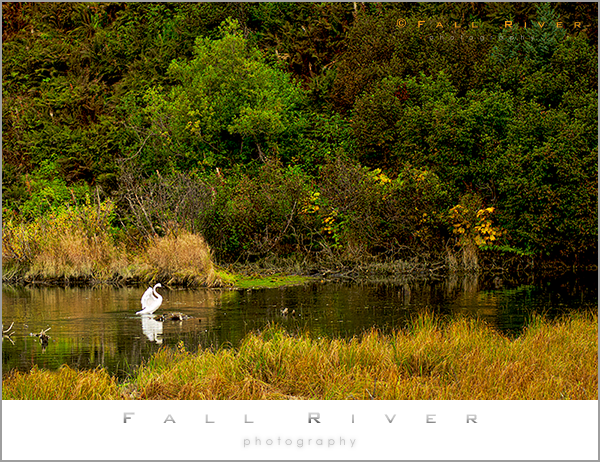 Trumpeter Swans diet consists predominately of foliage, seeds and various marsh plants. 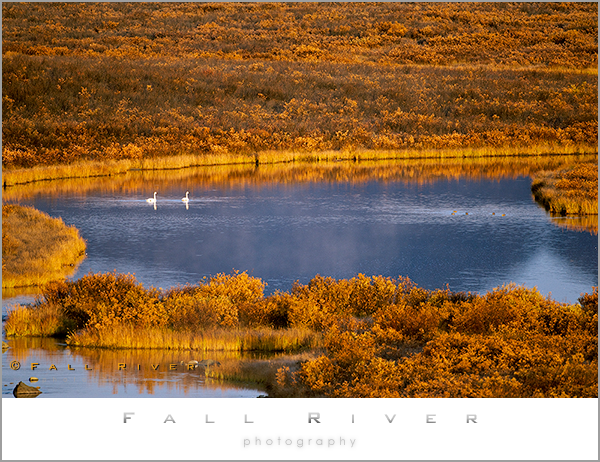 Studies have shown adult trumpeter swans capable of consuming more than 20 pounds of aquatic vegetation daily. Cygnets, upon first reaching the water require a high protein diet and focus their feeding efforts on the aquatic invertebrates for the first few weeks of growth. Alaska’s high invertebrate population supports this handily. 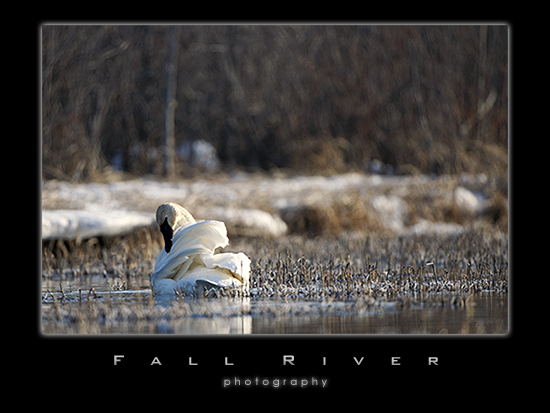 Newly introduced learned feeding patterns have provided a greater range of winter feeding habitat for the trumpeter swans. These new patterns provide for the swans to winter near agricultural fields and consume winter wheat and unharvested grains. It is notable that conflicts have arisen with farmers experiencing crop damage from roving flocks of swans but overall the swan population has benefitted from these new winter grounds.